“A fabulous Easter gift,” commented Monsanto Director of Development Initiatives Elizabeth Vancil. Nearly 60,000 seed sacks of hybrid corn seeds and other vegetable seeds were donated to post-earthquake Haiti by Monsanto. 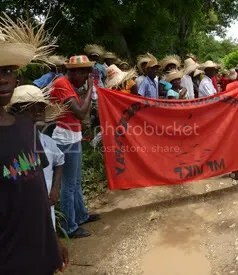 In observance of World Environment Day, June 4, 2010, roughly 10,000 rural Haitian farmers gathered in Papaye to march seven kilometers to Hinche in celebration of this gift. Despite overwhelming evidence to the contrary, some people believe that drinking raw milk or eating cheese made from raw milk is healthful and safe. It isn’t. And anyone who believes it is, ignores an unassailable body of scientific knowledge and common sense. Tagged as Costco-Bravo, E-coli, food safety, Fred Pritzker, health, LA Times, raw milk, risk, U.S.
STOUGHTON – Scott Trautman said he believes raw milk opponents are waiting for someone to get sick from drinking the milk so they can use the illness to thwart the movement to legalize it. “I grew up on raw milk and so did everyone who lived before pasteurized milk existed. We never became ill because of the milk. As a matter of fact, we made our own butter and fought siblings over the thick cream on top of the milk for our cereal. Big organic companies give approval for Monsanto’s GMO alfalfa — WTF? “I’d say this is the straw that broke the camel’s back…but I dare not, because I know this is only the beginning. Whole Foods, leader of natural grocery stores nationwide, and other industry leaders in “organic” foods Organic Valley and Stonyfield Farm relented under mounting pressure from all angles Thursday, and gave their approval for the USDA to use genetically-modified alfalfa seed in crops – proving once again that in this world, commodity-driven, profits-based monopoly models are what drive all decisions made in political and legal realms.